It is necessary to check your blood sugar regularly to keep track of it and to keep your blood sugar within the range recommended by your doctor. Nowadays, people have more choices to select the right glucometer available in the market. When we choose glucometer we try to focus on cost, ease of use, special features, support, and service. And ease of use is one of the major parameters among them. 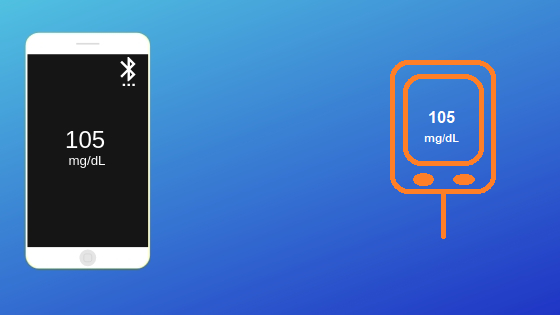 These days glucometers become wireless and with the help of bluetooth, it will sync your sugar level data to your smartphone which is very useful to analyze data for the patient as well as for doctors. It will give you real-time updates so you know how your treatment works on you. Through smart glucometer, you can share this data with your doctor and if any improvement is needed in your medicine or insulin you will get to know immediately. These are the products available in the market. It is a portable glucometer and works with a smart app for iOS and Android devices to help you manage your diabetes. It lets you measure and record blood sugar readings, share measurements with your doctor right from your smartphone or tablet. By integrating your blood glucose meter with a smartphone app you can simplify the management of your diabetes. Results captured throughout the day can be automatically synced and logged. And over time, your results may create meaningful insights into how your activities affect your sugar levels, which can help improve your understanding of your diabetes. This smart system allows you to engage at the level that is right for you to manage your diabetes. This device helps you to measure blood glucose levels anytime and anywhere. You can easily take readings, sync with the Beato app and maintain a log of all your previous readings to understand the pattern of sugar levels. This not only allows you to make necessary changes in your diet and lifestyle but also helps your doctor monitor your medication. This device plugs into your smartphone and can easily sync with it. Disclaimer: The above product information is just an overview of the product among the new products available in the market. We advise you to consult your doctor before choosing any product. Healthvera does not endorse any specific product.